Environmental issues directly affect the Central Valley in many ways and one class on campus has recognized them and even looked for solutions. 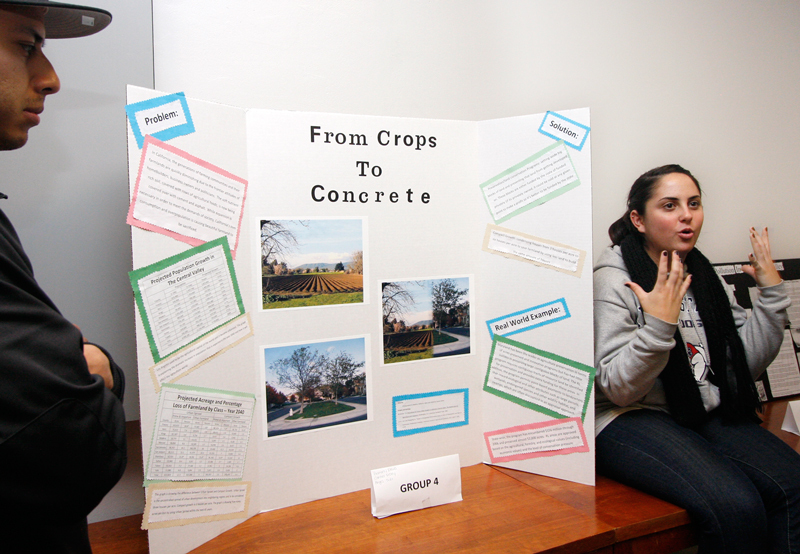 Geography 128, taught by assistant professor Derya Ozgoc-Caglar, Ph.D., presented displays of various environmental concerns. This is Ozgoc-Caglarâ€™s first semester teaching at Fresno State, and the first time the project has been done. Students from her two classes grouped up and chose an issue such as air pollution, wild fires and oil spills to focus on. Each group displayed a specific issue concerning the Valley and its community. Along with addressing the problems, they offered ideas that could help reduce their impact. One group focused on how school buses harm children by polluting the air. By riding old school buses, the chance of children getting asthma and/or cancer is greatly increased. Ard and her group found that if buses are turned off instead of left to idle while picking up kids, the particle matter is reduced. Ard also said they found that newer buses do not release as many harmful particles. Another group also looked at air pollution, but focused on the effects of diesel fuel. Since the Valley relies largely on agriculture, Peter Casacca, junior political science major, explained that many of the tractors used in the fields run on diesel fuel. â€œ[Diesel fuel] causes lots of health issues like respiratory illnesses and cardiovascular problems,â€ Casacca said. Melinda Montejano, junior health science major, said that the trucks used to transport harvest from the fields also run on diesel and pollute the air. Although they found that Los Angeles has the highest medical bills due to pollution-induced illnesses, the counties that make up the Central Valley also have large numbers. â€œThe CHP Web site said that 3,812 deaths are caused by air pollution each year,â€ Casacca said. They suggested that the transfer to bio-diesel fuel in tractors and trucks would decrease the amount of harmful emissions. Casacca also said that since the beginning of 2008, diesel engines have to be smogged. Prior to this year, it was not required. Carly Campbell and Tiffany Olguin presented a poster informing people how to properly dispose of motor oil. They found that most businesses that people bring their cars to properly recycle oil, but when it is done at home, it is often thrown in the trash. Campbell, a junior business accounting major, said it is very easy to recycle motor oil. Campbell said they also found some places that pay up to 16 cents per gallon for the oil. Although oil spills are most recognized as harming ocean settings and animals, Olguin said that spills and leaks on land also cause a lot of damage. Campbell said oil can be recycled and refined into motor oil again, but it is most difficult to refine the oil this much. It can also be used to oil roads during construction. Other groups concentrated on the growing population and how it will affect agriculture in the Valley. Bethany Davis said that by building up, there would be room for more houses without taking away all the farmland. â€œWith compact growth, the houses are closer together and they grow up, not out,â€ Davis said. Assistant professor Ozgoc-Caglar said she was pleasantly surprised by the outcome of the presentations.